Paris is a relatively easy city to get around. The centre is fairly compact and most of the sights are within walking distance of one another. 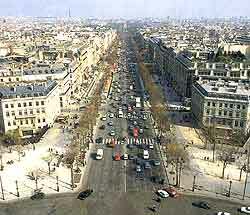 Much of the city, particularly central Paris, is pedestrianised. If you are in the city centre there is an excellent bus network and the local Metro underground railway runs an efficient service throughout the city. Alternatively, if you prefer to be driven around there are plenty of taxis, although these can prove an expensive way to travel. Paris consists of 20 districts or neighbourhoods known as arrondissements, which spiral clockwise in a snail-like shape, and are numbered from the centre outwards. Paris is home to no less than two very substantial airports, namely the Paris Charles de Gaulle Airport (CDG) and the Orly Airport (ORY) - France's two busiest. 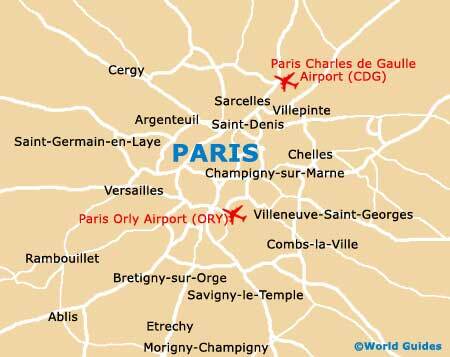 Both of these facilities are well connected to the city, with CDG being around 45 minutes to the north and serving more than 60 million passengers annually, while ORY is just 35 minutes to the south and each year handles close to 30 million passengers. Significant airlines operating at both include Air France, Air Méditerranée and EasyJet, amongst many others. If you are planning to drive around Paris during your stay, then do think very carefully before rushing in and renting a car. The traffic in this French capital is often extremely congested and chaotic, while parking spaces are hard to come by, particularly around the main attractions and the network of roads named the 'Boulevard des Maréchaux'. Even many locals here do not actually own a car, instead relying upon the metro trains and plentiful buses to get around much of the city. However, if you are planning to base yourself within the suburbs, perhaps nearby Fontainebleau, Vaux-le-Vicomte or Versailles, then driving around certainly becomes a more appealing and more practical transport option. 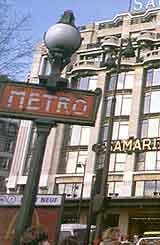 There are 15 metro lines criss-crossing the city and this is a clean, fast, and efficient way of travelling around Paris, but there can be lots of walking and climbing stairs to change lines. RER is the high-speed city / suburb network and you can transfer between the subway and the RER (Réseau Express Régional) for no additional cost. A book of tickets (carnet) provides the best value. Bus route maps are available in metro stations and at the Tourist Office. Within the city there are 55 routes which run from approximately 07:00 am to 20:30. Tickets are the same as the green ones for the metro and you only need one per ride. Punch your ticket in the machine as you board the bus. The original river boat service allows travel up and down the Seine. This boat-bus has calls at many riverside stops in central Paris, including the Eiffel Tower and Notre Dame. Taxis line up at stands located near intersections and metro stations. When the word 'Taxi' is lit up they are available for hire, but Paris taxi cabs are not easy to hail on the street. Many people leave 10% of the meter price but this is not obligatory. Taxi drivers speak little English and are reknown for being unpleasant to visitors. Passengers are expected to sit in the back of the vehicle and no more than three people will be transported on each journey. Additional fees may be charged for an extra passenger, animals or luggage. When asked drivers will provide you with a receipt (reçu).